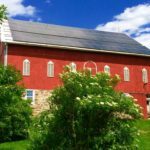 Gettysburg Stove and Solar is your local, knowledgeable source for renewable energy in South Central PA and Northern MD. I chose Gettysburg Stove and Solar mainly because I like and trust the owner, George Chorba, and all his staff. They are very positive, conscientious, knowledgeable and a pleasure to work with. Mr. Chorba was also willing to have my electrician install wiring, circuits and panel boxes which gave me added comfort. They worked very well together. The installers were efficient and particular. Our 1848 barn roof is sagging and uneven in some places but they worked hard to make the panels level. The clips which attached firmly to the standing seams mean the rails are attached without penetrating the roof. And as George predicted, the electric meter began spinning backwards as soon as they system was activated!